Hello to you – my lovely readers. I hope the month of April has started off nicely for you. In Vancouver, we were blessed with a wonderful Easter weekend full of sunshine and clear skies…heaven. I am currently down in Palm Springs visiting my Mom. My husband hiked a total of 250 KM on the Pacific Crest Trail and came out to meet me – healthy, happy, with only a few cuts and scrapes. I was a bit at a loss as to my wine category this month. Nothing really struck me and the days ticked by and suddenly it was Wednesday and it was time to get to work! I chose, for this week anyway, to do a Californian wine. I am usually quite discerning with my selections but to be honest – I was crunched for time and there is no good wine store in Palm Springs! So, I came home with Dreaming Tree Cabernet Sauvignon 2010. 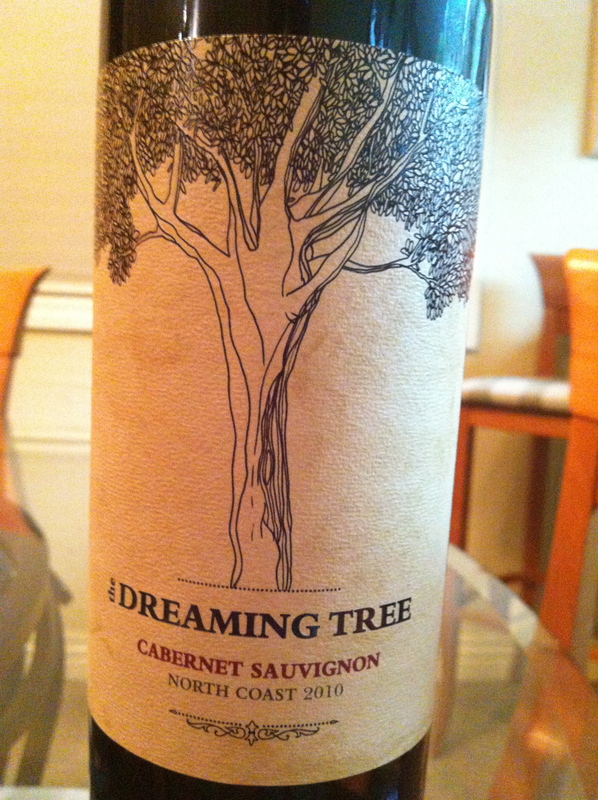 Dreaming Tree is the brain child of Dave Matthews (the musician) and Steve Reeder (winemaker). There are a sustainable winery and I give them huge kudos for their decision-making process around their wine making choices (sustainable corks, bottles being a quarter of a pound lighter to make it more fuel-efficient to be transported, etc.). Dreaming Tree’s Cabernet Sauvignon 2010 is a medium ruby in colour with aromas of blackberry, black cherry and sweet vanilla. This is a predominantly Cabernet Sauvignon wine with a splash of Merlot and Cabernet Franc thrown in for good measure. On the palate, the wine surprised me. It was dry with relatively low acidity and medium tannins. It was medium + in alcohol and body with a medium finish. This wine is aged for 18 months in oak which lends to the toasted vanilla flavours on the palate. The blackberry and black cherry were present on the palate as well. This wine is a drink now wine with not much potential for aging. I was disappointed with this wine. It is clearly in my ‘strongly dislike’ category. I was underwhelmed at the taste, the lack of balance and harmony that I was SOOOOO looking forward too! It retails for $18.99 in California and our B.C. Liquor Stores carry the Crush blend for $19.99. Just skip this Cabernet Sauvignon unless you want to taste Dave Matthews style of wine or want to contribute to the sustainable aspect of his winery. It is not bad, I just would never pick up another bottle. On that note, I think that April will be a theme-less and I will pick up what looks interesting or I am intrigued by instead of focusing in on a grape variety or a country or region. From sunny Palm Springs, I wish you a beautiful week.